Big name jockeys are over bet by the punting masses, which means they`re unprofitable to follow blindly. In this betting tutorial we`ll teach you how to look for profitable jockey, trainer, race course angles, and also provide some micro betting systems to follow. Most punters in the UK, seem to have a unhealthy obsession with backing jockeys even when they are riding horses which have a very limited chance of winning. It seems to be a kind of betting folklore which passes on from generation to generation. Obviously, jockeys play a vital role and their form must be considered when assessing a horses chance of winning a race. After all confidence breeds success and inform jockeys sometimes defy the statistics by winning on a horse which seemingly looked to have no chance pre-race. If you bear in mind that jockey form is directly related to trainer form and the quality of the horses they ride you will avoid basing your decision to bet solely on the jockey. Whilst it’s worth acknowledging that he is the most successful jumps jockey of all time. Betting is a game of skill and in order to make any long-term profits you must take an alternative view to the crowd. Just because Big Bazza, his brother-in-law and the rest of ill informed betting shop clientele are lumping on the heavyweight jockeys it doesn’t mean you should! 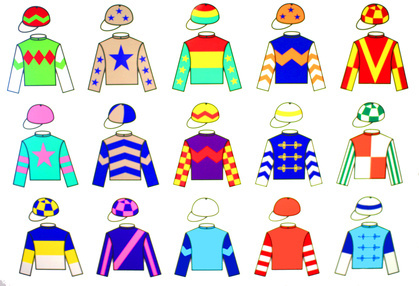 Remember these are the bookies favourite customer – they keep them in business. n the long run, the odds end up being too short so there is no long term profit on the winners. It’s clear from the data in the table that backing all A. P. McCoy’s mounts blindly would make a huge loss of -987.76 points. However under certain circumstances the champion National Hunt jockey is profitable to follow. To identify these angles we have used the digger feature in horseracing base. The table below outlines the most profitable trainer, race course combinations for A.P. McCoy since 2004. You can use these as profitable backing Micro betting systems. For the layers, its profitable to oppose A.P. Mc Coy’s horses in class one and two races simply because these are very competitive from both a jockey and trainer point of view. 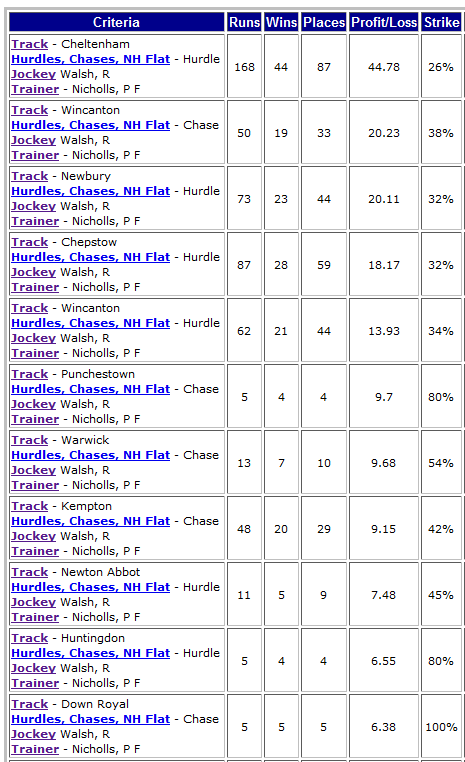 Ruby Walsh is Another popular jockey over bet by the public. It’s clear from the data in the table that backing or Ruby Walsh`s mounts blindly would make a huge loss of -688.70 points. However under certain circumstances this very talented jockey is profitable to follow. To identify these angles we have used the digger feature in horseracing base. The table below outlines the most profitable trainer, race course combinations for Ruby Walsh since 2004. These can be used as profitable backing Micro-systems. 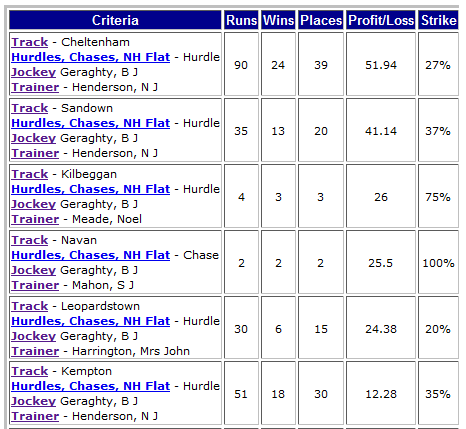 Finally, Barry Geraghty is another popular jockey who makes a overall loss if followed blindly. Backing all his rides since 2004 would have lost -820.08 points. However, just like A.P. McCoy and Ruby Walsh, if you back Barry Geraghty under certain conditions there are profits to be had, especially when riding for Nicky Henderson. The table below outlines the most profitable trainer, race course combinations for Barry Geraghty since 2004. You can use these as profitable backing micro betting systems. 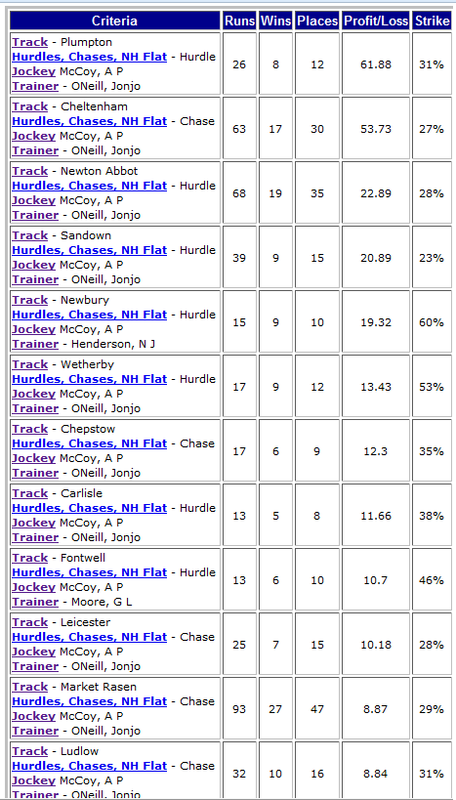 Although, it’s worth ignoring small sample size statistics, such as the Noel Meade and SJ Mahon data shown below. # don’t bet on horses being mounted by jockeys with low strike rates and poor recent form records (12% or less) consider these laying fodder, but only when value odds can be obtained. # your key objective should be to identify a combination of good horses mounted by in form jockeys, sent out by trainers with proven record at the track. Horseracing base is a fantastic tool for researching your own unique betting systems. Once you`ve identified profitable betting angles or systems you can set up HRB to send you the selections via e-mail each day, well in advance of racing. Profitable Claiming Jockeys & Their Most Potent Trainer Combinations.